It seems like lately my family and I are on-the-go all the time. With all this on the go I finding a nutritious snack for these times can be a challenge. It seems like I’m always running late so I’m always grabbing for quick, easy snacks. 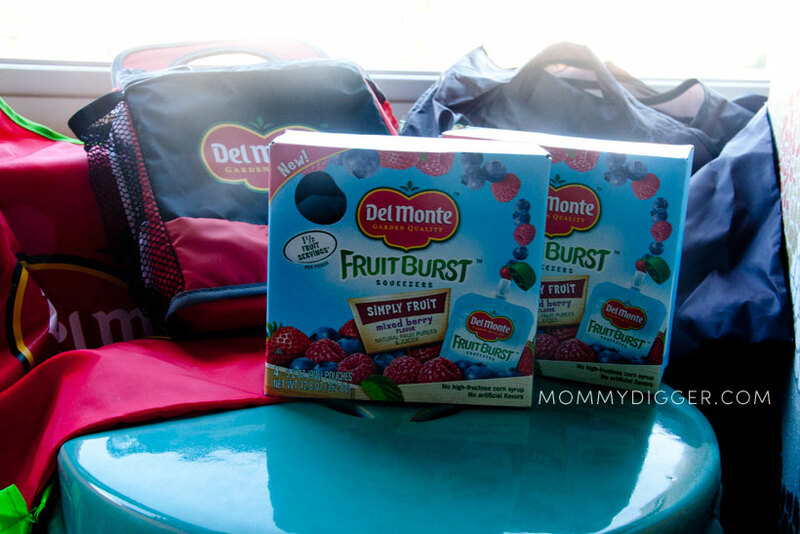 My Pinky loves those newer fruit pouches that are great for on the go snacking and Del Monte Fruit Burst Squeezers are now available in stores! My lucky girl and got to try them out! I went and bought more at Target and was pleasantly surprised by the price too. I got 2 boxes for $5! That’s eight pouches which is a great deal for the pouch style fruits, other brands are over a dollar each. Plus some varieties have them with veggies blended in – a great new way to sneak in another veggie! Made in the U.S.A., Del Monte Fruit Burst™ Squeezers contain 1 ½ servings of fruit or fruit and veggies and are an excellent source of vitamins A and C. In addition, Del Monte Fruit Burst™ Squeezers contain no artificial flavors or high fructose corn syrup. Peach-Mango: Pear puree concentrate, water, pumpkin juice concentrate, peach puree concentrate, pear juice concentrate, carrot juice concentrate, carrot puree, mango puree concentrate, natural flavors, ascorbic acid (vitamin C), citric acid. Blueberry: Pear puree concentrate, water, pumpkin juice concentrate, pear juice concentrate, natural flavors, carrot puree, blueberry puree concentrate, fruit and vegetable extracts for color, ascorbic acid (vitamin C), citric acid. Apple Cinnamon: Pear puree concentrate, water, apple puree concentrate, pear juice concentrate, natural flavors, ascorbic acid (vitamin C), cinnamon, malic acid. Mixed Berry: Pear puree concentrate, water, pear juice concentrate, natural flavors, strawberry puree, red raspberry puree concentrate, blueberry puree concentrate, fruit and vegetable extracts for color, ascorbic acid (vitamin C), malic acid. Strawberry: Pear puree concentrate, water, pear juice concentrate, strawberry puree concentrate, natural flavors, carmine, ascorbic acid (vitamin C), malic acid. I love that it’s a nutritious snack that she asks me for! I don’t have to battle her to try and get her to eat something healthy – YAY! To kick off the school year, Del Monte is launching the “First Day of School Photo Contest” through Facebook! All you have to do is upload an original photo of your child on their first day of school or yourself on your own first day of school. The top 20 Finalist photos will be posted to the Del Monte Fruit Squeezers website, and fans will have the chance to vote for their favorite photo. The winning entry will receive a $10,000 donation to a school of their choice! WIN IT! Del Monte Squeezers Prize Pack: Winner will receive two (2) boxes of Fruit Burst Squeezers (one Fruit + Veggies 4-pack and one Simply Fruit 4-pack), one (1) Del Monte lunchbox, one (1) orange-shaped eco-friendly shopping tote, one (1) strawberry-shaped eco-friendly shopping tote and one (1) Del Monte magnetic frame. I received product in exchange for my review. All thoughts and opinions are my own. For the kids I babysit in Peach-Mango! I want to win this for my son.He would like the apple cinnamon the best. I would like to win these for my 2 year old son. I think he would like peach-mango the best! This would be for Josie and I think that she would enjoy Mixed Berry! I want to win for my daughter. I think she will like the Apple Cinnamon. I would like to win them for my granddaughter. I think she would like Peach-Mango.